Our Annual General Meeting (AGM) has been scheduled for April 10th upstairs in the Chamber of Commerce building (old CPR bldg.) starting at 7 pm or 1900 hours. Over the last year the Nelson Paranormal League has been busy visiting a number of haunting requests throughout the Kootenays and has found some new and intriguing stories about local paranormal activity. This year they have updated the tours with these new findings that help draw potential conclusions to some of the Kootenays unexplained mysteries. 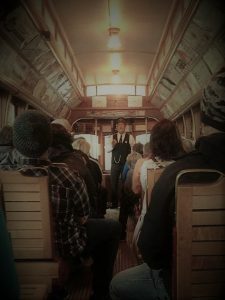 This October is the return of the popular Haunted Heritage Tour Streetcar#23 where guest are treated to a tour of Nelson’s less talked about haunted history. This year we have added more stops and more stories. Happening Saturday October 14, with two special runs at 4pm and 5:30pm, it is one of the best ways to enjoy Streetcar#23 before she is put to rest for the season. 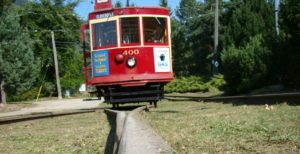 Half of all ticket sales will go the Nelson Electric Tramway Society (NETS) in support of their new mobile lift in Lakeside Park. Later in October the League presents two new tours, the Haunted Heritage Walking Tours and the Spirits of Nelson Haunted Pub Tour. Walking tours are being held on Saturday October 21st and 28th, and will leave from the Railway Visitors Centre to Touchstones Museum, getting up close and personal with some of Nelson’s most popular Haunts. On Thursday October 26th the Spirits of Nelson Haunted Pub Tour is an intimate tour of the darker side of the Haunted History of Nelson; this tour is not for kids or the weak of heart. Chris Holland of the NPL and NETS shares stories about Nelson’s Haunted History. To get tickets or make reservations for the tours contact the Railway Visitors Centre in Nelson at 250.352.3433. To find out more about the League and their future activities check them out on Facebook https://www.facebook.com/NelsonParanormalLeague/ . Local Credit Union Helps Tramway Society with free rides and admission for everyone. 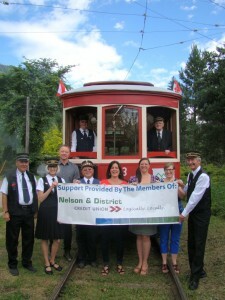 Nelson BC, For six years the Nelson & District Credit Union (NDCU) have been making a donation to the Nelson Electric Tramway Society (NETS) for free rides on Streetcar #23 and admission to the Trolley Barn Museum on Canada Day and it is a win win for everyone. 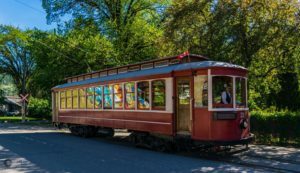 The Nelson Electric Tramway Society sets out with the task of generating enough revenue each year to keep Streetcar #23 and the Trolley Bar Museum open. This is done with the love and help of volunteers, but although the passion of people helps keep the society alive it also needs funds for maintenance, upgrades and supplies. 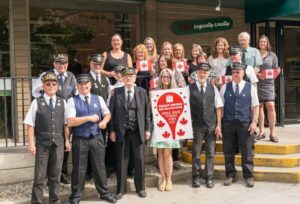 With the donation from the Nelson and District Credit Union the Tramway Society is able to bring smiles to people on Canada Day with free rides and admission to the museum and use the money to help keep Streetcar #23 on the rails. The NDCU recognize the significance of having StreetCar#23 as an attraction in Nelson. It provides visitors will another reason to visit this beautiful region, is a destination experience for enthusiasts and fun experience for the family. NETS also provide opportunities people to stay active and contribute to the continuing growth and beauty of our community. Once again, thanks to the Nelson and District Credit Union, at the July 1 Canada Day Celebration in Lakeside Park, there will be free rides on Streetcar #23, and free admission to the Trolley Barn Museum. 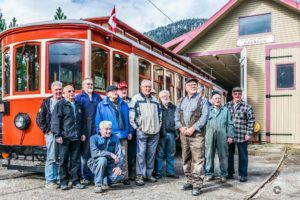 Nelson BC, The Nelson Electric Tramway Society has been hard working all winter getting ready for the 2017 season. 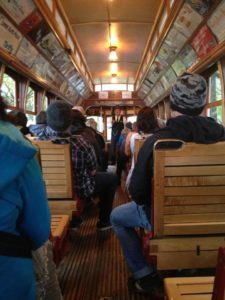 Streetcar#23 has had some much needed maintenance and accessibility upgrades, the volunteers have been through their training and this Friday May 19 they start the 2017 Season. They will be open for rides 7 days and week until Thanksgiving. The Trolley Barn Museum will also be open from noon to 3pm weekends until June when hours will expand. Last year the Tramway Society was host to close to 18,000 visitors, locals and rail enthusiasts, all with the support of an amazing group of volunteers. They are always on the lookout for more help, if you would like to get involved they suggest you come down for a ride or visit the Trolley Barn maintenance shop on Tuesday or Thursday mornings. The crew also have many fun events and surprises in store this year. To find out more, see the schedule or join their team check them out at www.NelsonStreetCar.org or call 250.352.7672. You can catch them for a ride starting 11:30am Friday May 19th at Lakeside Park. See you on the rails. Shake off the Snow – to the AGM we Go!! Yes it is that time of year again, our annual general meeting, come and get involved, or find out what is in store for the 2017 year. It is Tuesday April 4th, 2017 at 7:00pm upstairs at the NEW Chamber building in the train station. All are welcome! Learn more about how you can volunteer to Drive, Host and Help. 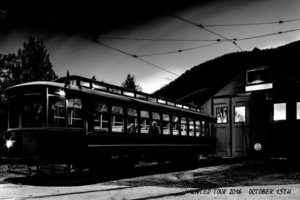 October is the return of the popular Haunted Heritage Tour Streetcar#23 where guest are treated to a tour of Nelson’s less talked about haunted history. This year we have added more stops and more stories. Happening Saturday October 15, with two special runs at 4pm and 5:30pm, it is one of the best ways to enjoy Streetcar#23 before she is put to rest for the season. Partial proceeds from these tours go to benefit the Nelson Electric Tramway Society (NETS), a wholly volunteer run organization. 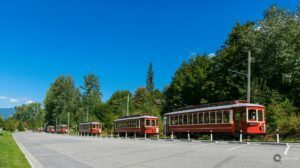 Nelson BC, The Nelson Electric Tramway Society (NETS), operators of Streetcar 23 and Birney Car 400, plan an annual Food Drive in an effort to raise much needed non-perishable food items as well as cash donations to help the less fortunate to cope with day to day challenges. This Saturday October 1st from 10am to 5pm they are offering free rides and special museum tours in exchange for a food donation, but due to parking lot construction Streetcar#23 may not be running that day. WE GO ON AS PLANNED…they said! The Food Drive has been named “FILL THE BIRNEY CAR” and that is the goal every year, to get enough food to fill every seat in the Birney Car 400. Each donation would permit the Donor to unlimited free Streetcar 23 rides, as well as an admission into our newly constructed Museum and the chance to win some fabulous prizes donated by local businesses. 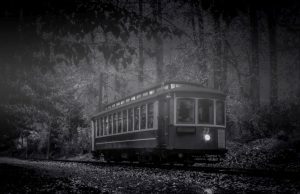 Even though the Streetcar may not be running that day, they encourage people to make their way to the Trolley Barn Museum for an extra special museum tour and a token for a free ride at a later date. This year the Fill the Birney Car will be on Saturday October 1st from 10am to 5pm. We look forward to seeing you there on the rails or at the Barn. Due to construction in the Mall Parking lot Streetcar#23 will be stopping services from Sept 21st til the end of the month. We will let you know as soon as we hear when the construction is completed. We are working on rescheduling the Haunted Heritage Tours and will keep you posted. Well the weather is nice take a relaxing ride along the water this weekend. We look forward to seeing on the rails!